Why isn't power for sale in airports? I think power usage should be sold in airports. Why not? The airlines need money. They can time box users, limit their usage, and create sharing opportunity to get those who part on the outlets out. Why is everyone on there devices in the airport? What could be so important? When I am in the airport, I take time to decompress. Traveling for work is exhausting, so I relax (I also think, or ponder, the result is usually entries for this site). I look around, I see everyone on their devices. I am not too important, not at all really, but I do web work. I support production live sites. My work has timelines and there is always more to do. It would make sense that I capitalized on downtime to do more work right? So I understand if people are getting a jump on work while they are in the air. However, I see a lot of facebook-ing and news reading verses writing documents, diagrams, and coding. I don't see a lot of people making the web a better place. 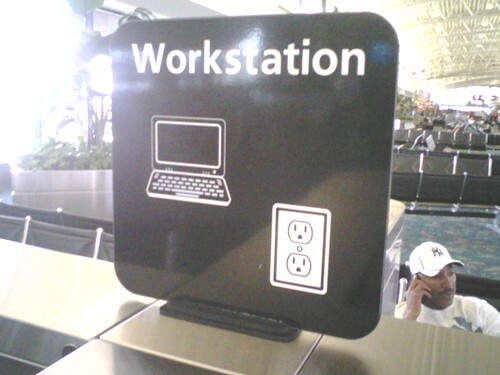 Recently the CLE airport added free wireless, and I think this is likely trending in other airports, which is enabling more people to get online as well. If they charge for power, at least the WIFI usage would be limited to those who properly charged their devices, or have their own data access. If not charge a fee, requiring a credit card swipe would reduce the crowding on outlets, and limits could be imposed on usage. And why doesn't anyone care about security? You're traffic is likely getting monitored. Given the points above, when I see some kid or some rich old retired guy with a high end device wasting away on facebook leaving their machine mostly idle, it bothers me. I know of several software developers that would love such a device but are stuck with something less optimal. The use the the computing is wasteful. The sale of such devices should involve a screening process of how you plan to use it, and then the usage should be monitored in order for you to keep using it. Wireless is available on the plane? The plane I flew on offered wireless internet... and I can't turn on my "electronic devices" during take off and landing? Seems odd. Even more odd, when I cracked open my machine on the plane to read a PDF paper I had been putting off, I noticed that my Google Maps directions were still "mostly" functional in the browser page left open. The map tiles had some zoom capabilities, and the browser back button toggled previous direction routes correctly and re-drew the pages. I was impressed. I am still traveling, I am going to post more, this was just the flight out.